If there’s anything better than spending a warm summer day on the water with family and friends, we have yet to find it. Sure, we all love a peaceful sunset cruise on our Bennington Pontoon Boat, but when the kids are out of school and the sun is shining bright, everyone wants to get out on the lake. Before you raise your anchor and head out on your Benny, you mustn’t forget the most important thing when you’re entertaining kids: the snacks! Don’t worry, we’ve saved you the time of having to find yummy, sweet treats for your crew. Here are five great snacks to serve kids while you’re out on the pontoon. For a delightful bite that’s fresh and crisp, try these crunchy apple boats. Not only are they nautical theme, but they pack loads of energy for a long day on the water. 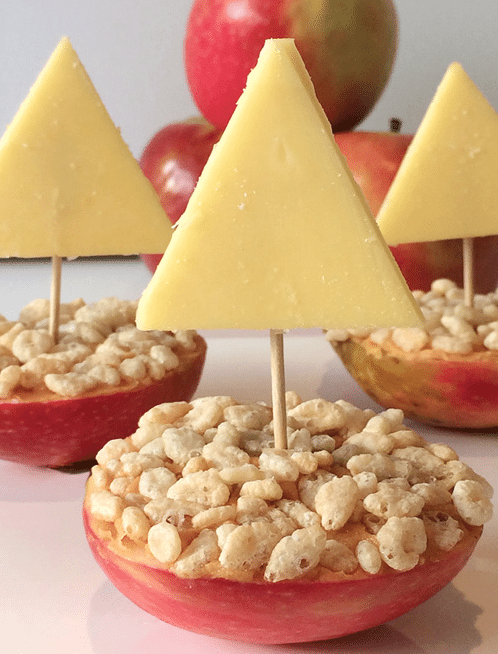 Cut a sail for your apple boat from a thick slice of cheese and attach with a toothpick. Your crew will like these treats so much, they won’t even notice how healthy they are! Keep your band of pontoon boat pirates happy with these easy-to-make frozen orange pops; perfect for cooling down in the heat. Bring the orange juice and honey to a simmer in a wide saucepan, whisking occasionally, over medium-high heat. Cook until reduced to 2 cups, about 25 minutes. Let cool completely. Add the orange-honey mixture, yogurt, orange zest, vanilla and a pinch of salt to a blender and puree until smooth. Pour into the pop molds. Freeze until set, at least 4 hours or overnight. To serve, take a pop from the freezer, run it under warm water and unmold. Another great healthy treat that kids will love is the fruit smoothie. Simple to prepare, this crowd pleaser is an absolute “must have” on the pontoon. In a blender, whip together all ingredients. Serve in glasses. See? Simple. Just say the word “fruit pizza” and kids come running. These bite-sized snacks are perfect for a quick break in between catching fish, tubing, or swimming around your pontoon. Cut out your crust. Use a plain tortilla (wheat or flour) and the ring of a mason jar to make small circle crusts. Combine first 4 ingredients in a bowl and whisk until well blended. Spread over tortillas and top with seasonal fruit, such as blackberries, strawberries, kiwi, mandarin oranges, grapes, or raspberries. Finally, we wrap up these great pontoon boat snacks for kids with frozen yogurt grapes; another quick snack that kids can’t get enough of. Pick grapes from stem and rinse. Place on a baking sheet and freeze for a few hours. Once frozen, stick a toothpick into each grape and dip into yogurt. If you chose another topping, this is the time to dip the yogurt covered grapes into it. Place back in the freezer for a few minutes, the yogurt will freeze quickly. You’re now ready for a fun and yummy day on your pontoon boat; the only thing left to do is to find your next Bennington Pontoon Boat at a dealer near you.